Tracy Williams, President of St. Vincent’s Medical Center Southside, part of Ascension Florida. 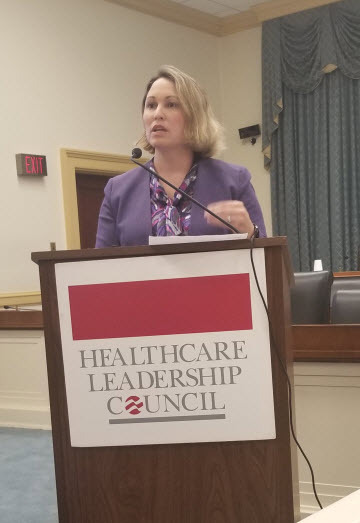 The Healthcare Leadership Council hosted a briefing on Capitol Hill that focused on expert perspectives from healthcare manufacturers, distributors, and providers on what it takes to coordinate disaster recovery and avoid disruption of healthcare services and supplies. The speakers presented lessons learned from recent hurricanes and how they developed new strategies so that patients and entire communities do not experience additional suffering due to these storms. John Crenshaw, regional director for Johnson & Johnson Health Care Systems, talked about the business continuity plans in place for disaster preparedness and recovery. He noted that not only is it important for J&J to have an extensive plan in place, but suppliers and other organizations need to prepare these plans as well for effective collaboration. Mr. Crenshaw stated that during disasters organizations need to focus on immediate basic needs first such as water, food and medicine. J&J has also established employee assistance programs to ensure that associates affected can get back on their feet as quickly as possible. Tracy Williams, President at St. Vincent’s Medical Center Southside, part of Ascension Florida, explained the Hospital Incident Command Structure (HICS) and the constant drills that hospitals run in preparation for natural disasters. She described the need for interactions between local, state, and federal officials to navigate help across state lines and between providers in multiple counties. Pre-planning is key for supply and equipment management in order to avoid shortages. Ms. Williams gave a few examples of the many tasks that hospitals need to take care of in advance, such as reviewing outpatient schedules, monitoring maternity patients, asking staff to stay in town despite evacuation orders, and updating the community of each hospital’s current status through social media. Jim Callahan, senior director of Global Business Resilience at AmerisourceBergen Corporation, discussed ABC’s role as a distributor and its strategies for minimizing losses and interruption of services during natural disasters. He stated that transportation was the biggest challenge in Houston after Hurricane Harvey. Alternate transportation options were needed for delivering supplies, and fuel supply was of critical importance. ABC worked with Healthcare Ready and the Federal Emergency Management Agency (FEMA) to get fuel for generators and help keep the medicine supply flowing. Mr. Callahan highlighted support for the Pandemic and All-Hazards Preparedness Act (PAHPA) reauthorization with adequate funding for implementation, and in particular he referenced Section 302 enhancements regarding logistical support and inclusion of private sector partners.